Our PVC Backed Coconut Coir Entrance Matting is the perfect solution for most entrance matting dilemmas and provides an affordable, sturdy and long lasting solution that works well to protect your building from the costs that the ingress of dirt and grime cause to interior floor finishes. With over 50 years of experience in specialist matting and flooring, we can attest to coir’s enduring popularity. PVC backed coir entrance matting remains one of the most cost effective and practical matting solutions the market has to offer. The benefits of our cut length service, means that there is no unnecessary wastage, as you can decide exactly how much coir is appropriate for your application. Not only does this traditional coir flooring offer a wide range of impressive features such as a high water holding ability, limited shrinkage, a long retention of its physical properties and good drainage, but it also has a beautiful natural coconut finish that struggles to look out of place in any well designed building whether modern or traditional. Our coconut coir matting has a range of different thicknesses 14mm, 17mm, 20mm, 23mm and 30mm, allowing for this mat to remain durable in toughest of conditions, and to fit well in to any existing matwell. Need the matting to fit an awkward angle? 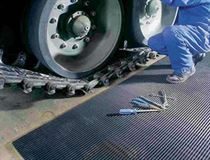 This matting is easy to trim yourself and reshape using a Stanley knife and a straight edge.